We’d love your help. Let us know what’s wrong with this preview of Mufaro's Beautiful Daughters by John Steptoe. Inspired by a traditional African folktale, this is the story of Mufaro, who is proud of his two beautiful daughters. 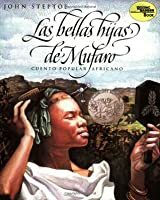 Nyasha is kind and considerate, but eve A Caldecott Honor and Reading Rainbow book, this memorable retelling of Cinderella is perfect for introducing children to the fairy tale as well as the history, culture, and geography of the African nation of Zimbabwe. To ask other readers questions about Mufaro's Beautiful Daughters, please sign up. Amber This is a fairly popular book. Check your local library or Amazon. John Steptoe's absolutely brilliant Mufaro's Beautiful Daughters is basically an African take on the globally-known and ever popular Cinderella folklore theme (both narrative and illustrations are outstanding in every way and their lovely and evocative marriage, their delightful combination, turn Mufaro's Beautiful Daughters into truly a shining and glistening gem of a picture book, and not only for children, but actually for anyone interested in and appreciative of global folk and fairy tales). John Steptoe's absolutely brilliant Mufaro's Beautiful Daughters is basically an African take on the globally-known and ever popular Cinderella folklore theme (both narrative and illustrations are outstanding in every way and their lovely and evocative marriage, their delightful combination, turn Mufaro's Beautiful Daughters into truly a shining and glistening gem of a picture book, and not only for children, but actually for anyone interested in and appreciative of global folk and fairy tales). And while the tale, while John Steptoe's presented or rather his adapted narrative (like many if not most Cinderella-type stories) is indeed perhaps rather predictable, it is still and indeed engagingly narrated and the evocative accompanying illustrations are simply and utterly almost too beautiful for words. Furthermore, the fact that details of the illustrations are based on the ruins of an ancient city found in Zimbabwe, pays necessary and cultural homage to the historic civilisations of Africa. Now personally, I especially and particularly have enjoyed that Mufaro's Beautiful Daughters really features no absolute and horrible villains. Manyara might be vain, proud, unhappy and most definitely constantly teases her sister Nyasha, but she also NEVER tries to actively harm her sister (unlike so many of the other Cinderella-type stories, where the stepsisters or siblings, as well as the stepmothers not only constantly make life miserable for the heroine, but often try to actively harm, and sometimes even kill the poor girl). And when Mufaro and Nyasha finally arrive in the city, Manyara even attempts to warn her sister about the supposed monster. Manyara thus, even with her proud vanity, even though she is selfish and often prone to teasing and nastiness, cares about her sister's safety and she obviously could not have known that for Nyasha, having passed the test that Manyara herself has failed, the snake would turn into the king (and then of course become Nyasha's husband). The illustrations are magnificent, with lovely depictions of the people and animals. This tale is fairy tale like predictable but very entertaining. The Children's Books group has chosen this book for one of its picture books for April, for the Picture Books Cl The illustrations are magnificent, with lovely depictions of the people and animals. 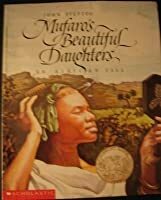 “Mufaro’s Beautiful Daughters” is a Caldecott Honor Book by John Steptoe and it is about how Mufaro’s two beautiful daughters are invited to the king’s palace so that the king will choose a worthy bride, but Manyara, the greedy sister, tries to go off to the king’s palace by herself and meets some disastrous results. “Mufaro’s Beautiful Daughters” is a magnificent tale that children will definitely read for many years! John Steptoe has done a magnificent job at both illustrating and writing this “Mufaro’s Beautiful Daughters” is a Caldecott Honor Book by John Steptoe and it is about how Mufaro’s two beautiful daughters are invited to the king’s palace so that the king will choose a worthy bride, but Manyara, the greedy sister, tries to go off to the king’s palace by herself and meets some disastrous results. “Mufaro’s Beautiful Daughters” is a magnificent tale that children will definitely read for many years! John Steptoe has done a magnificent job at both illustrating and writing this book. John Steptoe effectively retells this ancient African folktale with such tenderness that children will easily get the message about how true kindness towards others will bring the greatest rewards and how greed will bring about the downfall of a person with an extremely proud heart. John Steptoe’s illustrations are extremely beautiful as he makes the characters look extremely realistic and colorful. The highlighted images in this book are the images of the forest itself as the forest looks eerie at night since the branches of the trees are shadowed in a creepy way and when the forest is shown during the day, then the forest looks tranquil and beautiful as you can see various flowers blooming all over the pages of the forest. “Mufaro’s Beautiful Daughters” is great hit for children who love African folktales and will be a favorite for the whole family to enjoy for many years. I would recommend this book to children ages five and up since there are some African names like “Manyara” and “Nyasha” that might be difficult for smaller children to pronounce. I should say this is a gorgeous, gorgeous book and Steptoe deserved all the awards and acclaim for it as a work of art. What it is NOT is a book to introduce children to either Cinderella or Zimbabwe. He was inspired by a visit to Zimbabwe to do the story and beautiful it is, but it is absolutely not the way to introduce children to the continent of Africa or Zimbabwe, for that matter. And since the story is one made-up by Steptoe I question using it as an intro into Cinderella stories. I remember having thins book as a child and bought it for my own daughters a few years ago. I've read it many times, and love that something I cherished could be passed on to them, teaching a great lesson in being kind to others, including your own sister. This is a fabulous tale, full of magic, wonder, kindness, grace and even greed and jealousy. The illustrations are marvelous and really enhance the story. Our girls enjoyed this story a lot and I had fun reading it to them. This book was selected as one of the April 2011 Royalty themed reads for the Picture-Book Club in the Children's Book group here at Goodreads. This book was also selected as one of the books for the August 2016- Caldecott Honor discussion at the Picture-Book Club in the Child This is a fabulous tale, full of magic, wonder, kindness, grace and even greed and jealousy. This book was also selected as one of the books for the August 2016- Caldecott Honor discussion at the Picture-Book Club in the Children's Books Group here at Goodreads. Mufaro’s Beautiful Daughters, John Steptoe, is an African Cinderella story. Mufaro was a happy man and a very proud father. Mufaro had two very beautiful daughters who lived with him. Nyasha was kind, considerate, and very beautiful. Manyara, Mufuaro’s other daughter was very cruel, mean, and rude. Everyone knew this about Manyara; everyone except for Mufaro. Manyara spent all of her time teasing her sister. On day, the king decided he wanted to get married and invited "The Most Worthy and Beaut Mufaro’s Beautiful Daughters, John Steptoe, is an African Cinderella story. Mufaro was a happy man and a very proud father. Mufaro had two very beautiful daughters who lived with him. Nyasha was kind, considerate, and very beautiful. Manyara, Mufuaro’s other daughter was very cruel, mean, and rude. Everyone knew this about Manyara; everyone except for Mufaro. Manyara spent all of her time teasing her sister. On day, the king decided he wanted to get married and invited "The Most Worthy and Beautiful Daughters in the Land" to appear before him. Manyara wanted her father only to send her, but Mufaro decided that only the king could choose between his most worthy daughters. Manyara, of course, didn't agree, and set out to make certain that she would be chosen by leaving before everyone else. Along the way, the magical king had disguised himself as an old woman, a garden snake, and a young (and very hungry) boy. Manyara treated all of these people very rudely, however Nyasha was kind. Her kindness in the end is what won the heart of the king, and they lived happily ever after! Mufaro's Beautiful Daughters is loosely based on the traditional Cinderella story, and elements of that can be seen throughout the story. It begins with two sisters, Manyara who is selfish and cruel and Nyasha who is clever and kind. Mufaro never saw the difference in personality in his two daughters, but Manyara continually mistreated her sister and others, much like the evil step-sisters in Cinderella. When the King asked to see the sisters, they were put through a series of character tests al Mufaro's Beautiful Daughters is loosely based on the traditional Cinderella story, and elements of that can be seen throughout the story. It begins with two sisters, Manyara who is selfish and cruel and Nyasha who is clever and kind. Mufaro never saw the difference in personality in his two daughters, but Manyara continually mistreated her sister and others, much like the evil step-sisters in Cinderella. When the King asked to see the sisters, they were put through a series of character tests along the way. In the end, the morality of the sisters meant their fate. A tale of kindness and selfishness, and their corresponding consequences. I've loved this book ever since I saw it on "Reading Rainbow" as a child. For whatever reason the book was burned into my memory and I was always delighted whenever it was featured on the show. The story, the illustrations... everything made a huge impression on me. SO, as an adult I was anxious-excited and anxious-apprehensive to find out if the book would still be as wonderful as I remembered. I still love it! Yes, upon rea A tale of kindness and selfishness, and their corresponding consequences. I still love it! Yes, upon reading it as an adult there are things that I would like a teeny more depth to, and for that I'd probably have awarded this four stars, but I thought the fact it made such an impression on me when I was younger deserved the extra star. This Caldecott Honor picture Book of an African folk tale is illustrated and shared with us by John Steptoe. It is the story of a man, Mufaro, in an African village whose king is seeking a bride and how the man's two daughters, Nyasha and Manyara, persue that dream. It's premise is of pride going before a fall, but for me it was more than anything a story of kindness rewarded for its own sake. This is one of the most beautifully illustrated books I have read, with lush, deep shades of colors i This Caldecott Honor picture Book of an African folk tale is illustrated and shared with us by John Steptoe. It is the story of a man, Mufaro, in an African village whose king is seeking a bride and how the man's two daughters, Nyasha and Manyara, persue that dream. It's premise is of pride going before a fall, but for me it was more than anything a story of kindness rewarded for its own sake. This is one of the most beautifully illustrated books I have read, with lush, deep shades of colors in the foliage and sky. It is illustrated in the Realism style and Steptoe's artistry with the expression on the characters' faces and hand gestures is superb. I highly recommend, however, listening to this tale as it is read by Robin Miles and following along in the book. Her African accent lends a beauty to the fable that my feeble imagination could not. Dedicating his book to the children of South Africa, Steptoe writes that he was inspired by a folktale collected by G.M. Theal and published in 1895 in his book, Kaffir Folktales. The illustrations were inspired by the ruins of ancient city in Zimbabwe. The author note also goes on to explain the characters' names and what they mean in their native language. I think this book could be used in a classroom curriculum in multiple ways, such as unit studying the message and characters in the fables and folk tales from foreign countries, that could include as "How many spots does a leopard have? and other tales" by Julius Lester which includes African and Jewish tales, "Folk tales & fables of Asia & Australia" by Robert Ingpen & Barbara Hayes, "Russian folk-tales" retold by James Riordan, as a few examples. Whenever possible, have the same choices available to be heard as well as read, such as "The rainbow people" by Laurence Yep. Or it could be paired with other African folktales, such "The Lion and the Ostrich Chick" by Ashley Bryan, which includes folk tales from Hausa, Angolan, Masai, and Bushmen people of Africa and then extend it on with non-fiction during a unit on Africa. It also could be as an example of how to notice important parts of the illustrations. It could be used for lessons on sequencing, or writing with dialogue. The overall message could spur a good discussion at many grades, from kindergarten up. It would be a wonderful thing to have in a listening center for younger students such as second -graders. 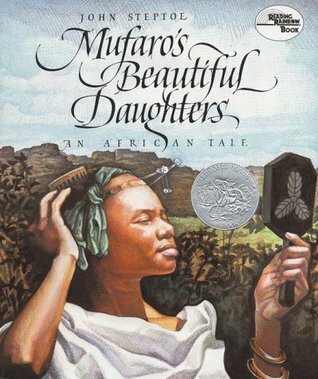 Mufaro's Beautiful Daughters: An African Tales was an African tale reminiscent of Cinderella. The illustrations were lovely. I can see how it was a Caldecott Honor Book. All the woman of the land are invited to the king's palace so he can choose his worthy bride. Both Mufaro's daughters are beautiful, but only one is beautiful both inside and out. 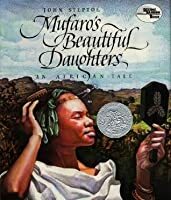 Nyasha was so compassionate that she didn't even tell her father the way Manyara treated her because she was too considerate of her father's feelings t Mufaro's Beautiful Daughters: An African Tales was an African tale reminiscent of Cinderella. The illustrations were lovely. I can see how it was a Caldecott Honor Book. All the woman of the land are invited to the king's palace so he can choose his worthy bride. Both Mufaro's daughters are beautiful, but only one is beautiful both inside and out. Nyasha was so compassionate that she didn't even tell her father the way Manyara treated her because she was too considerate of her father's feelings to complain. I love the magic of the story and the way the story ends. A classic good trumps evil tale. I read this when I was about 10 at my school and it was a beautiful story about beauty not always being on the outside, but the inside, and that being a good person was better than being beautiful. I've always kept this story in my heart and I think it's a great reendition of Cinderella for little black girls and even other races. This review has been hidden because it contains spoilers. To view it, click here. 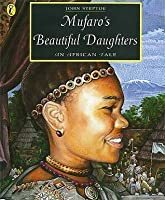 “Mufaro’s Beautiful Daughters: An African Tale”, written by John Steptol and inspired by a folktale from Southern Africa, is a story of two sisters who want to marry a king. Nyasha is kind-hearted, humble, and hardworking, while her sister Manyara is selfish and scheming, and treats Nyasha terribly. When news arrives that the king is looking for a wife, Manyara sneaks away to the kingdom immediately. Manyara insults many people on her way to the kingdom, including a starving boy who asks for foo “Mufaro’s Beautiful Daughters: An African Tale”, written by John Steptol and inspired by a folktale from Southern Africa, is a story of two sisters who want to marry a king. Nyasha is kind-hearted, humble, and hardworking, while her sister Manyara is selfish and scheming, and treats Nyasha terribly. When news arrives that the king is looking for a wife, Manyara sneaks away to the kingdom immediately. Manyara insults many people on her way to the kingdom, including a starving boy who asks for food. Nyasha, on the other hand, is kind to everyone she meets, feeding the same starving boy. Nyasha is even kind to the snake she meets in the kingdom. The snake then transforms into the king and reveals that he was disguised as all of the people the sisters confronted along the way. Justice prevails, as the king chooses Nyasha as his queen and Manyara becomes a servant. This story is powerful because is presents a Cinderella-like story from a different cultural perspective. It also teaches a powerful lesson that it is important be respectful to every person you meet, because you never know how that person may impact your life later one. This book is a Caldecott Honor Book. I would highly recommend this book as a quality read aloud option for first or second grade students. Because of this book’s similarities and differences to our traditional Cinderella story, it could be used when teaching a unit that compares and contrasts cultures. Additionally, because it teaches the importance of kindness and respect, it could be used at the beginning of the year when introducing classroom expectations, or as part of a social studies unit on good citizenship. Message: The importance of kindness towards everyone, regardless of their appearance. Steptoe died tragically at age 38 of AIDS. This is his most acclaimed book and I thoroughly enjoyed it. Everything from the lush paintings to the exquisite prose. All children ( and teens and adults) should experience the lessons contained in the text. Teachers take note, this book is a wonderful choice for a lesson on character education. Caldecott award winner. Gorgeous illustrations and a quality folk tale. I enjoyed reading this book. It’s based on an African culture. After reading this book, I decided to choose a text –to text concept because It reminded me of the book Cinderella. I would incorporate this story in my classroom by using a vienn diagraph to compare and contrast two different versions of this story. I would also ask open ended question to have the children think to get appropriate responses. This African tale won the Caldecott Honor Medal in the year 1988. It is a Cinderella type of fairytale but from the African nation. The story is about Mufaro’s two daughters. One of his daughters is Nyasha, who is a kind and selfless young lady. The other daughter is Manyara who is spoiled and selfish. Without Mufaro knowing, Manyara constantly tells her sister that she will one day be queen and Nyasha will be her servant. Nyasha only answered that she would be glad to serve her well but Manyara This African tale won the Caldecott Honor Medal in the year 1988. It is a Cinderella type of fairytale but from the African nation. The story is about Mufaro’s two daughters. One of his daughters is Nyasha, who is a kind and selfless young lady. The other daughter is Manyara who is spoiled and selfish. Without Mufaro knowing, Manyara constantly tells her sister that she will one day be queen and Nyasha will be her servant. Nyasha only answered that she would be glad to serve her well but Manyara was never happy, not even with that obedient answer. Nyasha is content with her life and on her land she grows food and even has a snake whom she pats on the head and asks him to care for her crops. One day, word came to Mufaro and his daughters, that the king was looking for a bride. Mufaro said that both his daughters go, but Manyara tried to convince her father that she was the best candidate, for Nyasha would miss him so. Mufaro insisted that both should go. Manyara furious and wanting too be the first young lady the king met, embarks on her own through the forest to the palace. On the way, she finds a hungry boy which she refuses to give any food, an old lady who she ignores and mocks, and follows her way to the palace. The next morning when Mufaro, Nyasha, and the rest of the wedding party are about to leave, they notice Manyara is missing. Although, they see her footprints on the way to the palace, so they continue their journey there. Nyasha found the hungry boy and gave him a yam, to the old lady she gave sunflower seeds and paid attention to her warnings, and they arrived safely to the town. When they arrived, Manyara was running away and screaming something about a five-headed snake telling her she was not worthy. Nyasha bravely enters and finds her snake there. When she asks him what he is doing there, the garden snake told her he was the king and changed before her eyes. The King told her he was also the hungry boy and the old lady, and that he knew she was the most worthy so she wad the chosen one to be queen. The story ended with Mufaro exclaiming he was the happiest father, for he had two beautiful daughters, Nyasha the queen and Manyara a servant in the queen’s household. As this story is a variation of the Cinderella fairytale, it is suitable for children in general, not only little girls. Because even though the characters are girls, the same thing could happen in reverse. And the lesson taught in it is not gender specific. This African tale teaches kids to be kind no matter what and to be selfless. There are great things to conquer in life with only kindness as a weapon, and conquer you will. Jealousy is a horrendous trait, especially from your own family. This lesson is a great one to learn early in life, educators know this, that is why the book is in the common core and while searching for the story, I even found the lesson plan for it. Inn my honest opinion, the Cinderella-like fairytales are magical. They gives the child, whether he or she is naughty or nice, the opportunity to see both sides of the story. Usually the stepsisters, or sisters in this case, have a reason to be or lack something crucial in their upbringing that makes them take it out on poor Cinderella. Besides, each and every person is different, each has their strong points, each has their shortcomings; yet we should all be happy with what we have and what we are. You should also be careful what you say, for words turn into actions. Such was the power in Manyara’s words about one sister being the queen and the other the servant, the only problem was that it happened but the other way around. Book review: Mufaro’s Beautiful Daughters: An African Tale. This African tale tells a story of two opposite sisters from a small family, living in one of the many rural areas in Africa. Whilst Mufaro’s daughters were both beautiful in appearance, their inner beauty could not be more different. Locals complemented Nyasha’s kind, graceful and responsible qualities. On the contrary, Manyara was a very temperamental, rude and malicious person, especially to her sister whom she was very jealous of. Ny Book review: Mufaro’s Beautiful Daughters: An African Tale. This African tale tells a story of two opposite sisters from a small family, living in one of the many rural areas in Africa. Whilst Mufaro’s daughters were both beautiful in appearance, their inner beauty could not be more different. Locals complemented Nyasha’s kind, graceful and responsible qualities. On the contrary, Manyara was a very temperamental, rude and malicious person, especially to her sister whom she was very jealous of. Nyasha was very tolerant of her sister’s mean behaviour towards her and did not retaliate. Nyasha befriends a snake called Nyoka, who comes to visit her while she works in her garden. Meanwhile, Mufaro remains oblivious to Manyara’s antics as she was vigilant in his presence and selfless Nyasha is too mindful of upsetting her father to complain. When one day, the king from the nearby city calls for all girls to be presented before him so that he may choose a wife, Mufaro decides both of his daughters must attend. Seeing as Mufaro refused Manyara’s proposition to be sent to the city before the king without Nyasha accompanying her, she begins to secretly travel to the city alone. In her night journey, she comes across a small hungry boy whom she refuses to give food. Then she meets an old woman who advises her wisely regarding a group of laughing trees and a man who Manyara will come across in her journey. Yet Manyara responds disrespectfully. Consequently, when Manyara does come to pass the laughing trees and the old man she disregards the old women’s advice. Back at the village, at the strike of dawn, in frenzy looking for her, everyone start following Manyara’s footprints to the city. As Nyasha passes the same route, she gives food to the hungry boy and thanks the old women with a gift for her help. Finally, having reached the kingdom, Mufaro and Nyasha find Manyara running out the king’s chambers frightened. 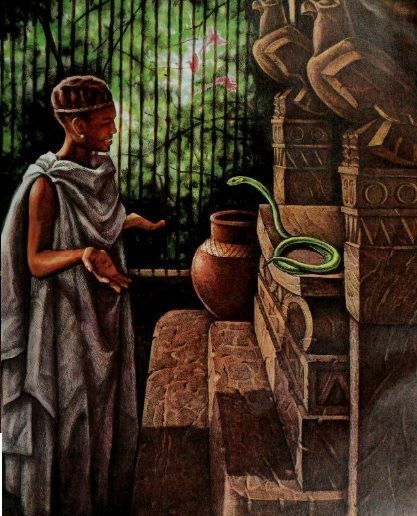 Manyara advised her sister against visiting the king, whom she described as a snake with five heads who claimed to know all her faults. Nyasha entered the king’s chamber to find Nyoka sitting on the throne revealing that he is the king, as well as the little hungry boy Nyasha had fed and the wise old women Nyasha had gifted. And so Nyasha was chosen as the new queen, with Manyara being the servant at the kingdom. This is grasping story that can be used with Reception children, Key Stage one and two to teach them the importance of good manners, following instructions and can be implemented to deter bullying. The different forms of bullying and how to deal with it can be discussed. It can also be used as an African folk tale during international week, which can be performed at school assemblies. A highly recommended read. The pictures in this book are stunning and is a Caldecott Honor’s picture book. The picture’s help you to understand the story and almost feel like you are there; an African tale from Zimbabwe. Besides the great pictures, the story of Mufaro’s Daughters was inspired by a folk tale and is a great lesson for children. I would put this book at a 5th grade reading level, but is a guided reading level N, as a read aloud I would go as low as second grade. The king who is disguised as a garden snake (a The pictures in this book are stunning and is a Caldecott Honor’s picture book. The picture’s help you to understand the story and almost feel like you are there; an African tale from Zimbabwe. Besides the great pictures, the story of Mufaro’s Daughters was inspired by a folk tale and is a great lesson for children. I would put this book at a 5th grade reading level, but is a guided reading level N, as a read aloud I would go as low as second grade. The king who is disguised as a garden snake (also called a garter snake in some places) must choose a wife. 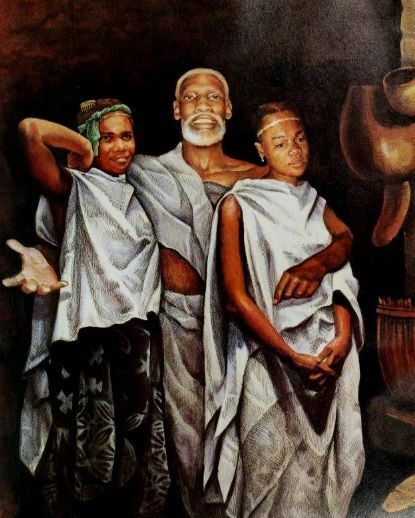 When the king decides to invite "The Most Worthy and Beautiful Daughters in the Land" to appear before him, Mufaro (father) declared proudly that only the king could choose between Nyasha and Manyara. The lesson of kindness and compassion shine through at this point. Manyara wants to be chosen for selfish reasons, she sets out prior to her sister Nyasha to reach the king first. Nyasha, depicted as a virtuous kind hearted young lady in the end, I think we can guess what happens, the virtuous young lady’s compassion and kindness win. The lessons of just rewards, kindness and compassion, manners and conduct, and sibling rivalry make this a great book for children to understand the importance of values and the importance of their behavior even at a young age. The illustrations in this book show the fortress-city of Great Zimbabwe in ancient times. In the classroom one idea is that the “African Culture” could be used as a way to teach, some ideas:How do the plants and animals reflect an African setting? What else in the illustrations suggest an African setting? How do these versions differ and how are they alike? How do they reflect the culture they come from? How is the Cinderella story you may be familiar with differ? This book takes place a long time ago in a certain village in Africa. Mufaro is a father of two daughters named, Manyara and Nyasha which in their village are considered very beautiful. Manyara is very mean to her sister Nyasha because they entire village views Nyasha as the most kind hearted person in the village and Manyara does not like this one bit. One day, the king of the land calls out to all the most worthy and beautiful daughters in the land to appear in front of him and for one of the daughters to be chosen as his wife. Being the meanest of the sisters Nyasha wants to be the first daughter the king sees so she sets forth the night before to get there first. Little did she know that her greed and unkind fullness heart will not lead to good things. The pictures in this book are very detailed and make the story come to life. After every page turn there are pages filled with color which your eyes cannot look away. You can see the expressions on each of the characters faces which makes the characters stand out a lot more. I liked that this is a different version of the Cinderella most people know. It is really intriguing to hear a different side to this story from a different culture. I gave this book 5 stars because the whole story behind the tale is a great lesson for students to know. The message in this story is not to be greedy and mean to people you come across especially your own family. If you are kind and respectful to each and every individual and treat them how you want to be treated in the end you will be rewarded. I think this is a great message for children especially if it is in a school where bullying occurs frequently. Overall, this book was a great read. A classroom activity that could work for this book, which comes from teachingbooks.net, could be to write the story as to what happens next. Doing this, will work on the student’s creativity and to see how well they understand the concept of being kind to others. This book is a retelling of the fairytale, Cinderella but reframed to take place in an African country. The book follows the traditional fairytale pacing in which the story begins with a sort of "once upon a time" feeling, quickly introduces the problem, follows a rhythm of threes, and tidily provides a resolution. In the story, a king is looking for a new wife. Mufaro has two beautiful daughters, Manyara and Nyasha, who he feels could be the next queen. Unlike most Cinderella stories, the "evil This book is a retelling of the fairytale, Cinderella but reframed to take place in an African country. The book follows the traditional fairytale pacing in which the story begins with a sort of "once upon a time" feeling, quickly introduces the problem, follows a rhythm of threes, and tidily provides a resolution. In the story, a king is looking for a new wife. Mufaro has two beautiful daughters, Manyara and Nyasha, who he feels could be the next queen. Unlike most Cinderella stories, the "evil sister" is not truly evil, just a little bratty. She is a full round character with positive and negative attributes. She can be a bit selfish and a bit haughty but she truly cares for her sister. Her sister is not quite the "good sister" either. She is virtuous in many ways and these virtues are rewarded with her becoming queen. But she is also a little naive and headstrong. 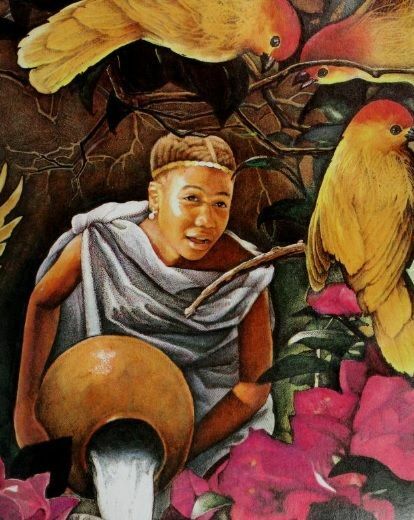 This book is an African folklore story about two sisters Mufaro is the younger kinder sister. Her older sister tells her one day that when she is queen she is going to love having her little sister live with ....as her servant. Mufaro does not understand why her sister is so unhappy and mean to her. Nyasha tells her it is because she is favored, or Nyasha thought so anyway, by their father. Mufaro keeps a garden where one day a garden snake comes to visit that she keeps and is kind to. The king announces that he wants the worthiest daughters to be sent to him so he could pick a wife. Nyasha leaves a night early to beat Mfaro there and encounters choices along the way that reinforce he she is not a good person at heart. When Mufaro encounters those same situations she does the right thing and is kind. At the end the Nyasha is greeted by a snack rather than the Prince, who tells her of all of her flaws. When Mufaro goes into see the Prince she see that the snakes was the garden snake from her vegetable garden at hoe. The snake turns into a Prince and marries Mufaro who has proven to be the most worthy and Nyasha lives with them as a servant.